Since John’s birthday, Valentine’s Day and the three-day President’s Day weekend all coincided this year, we did something we’ve been intending to do for a long time – take an overnight trip to Gettysburg, PA. We’d made a quick visit through the battlefield many years ago, but we’d always wanted to tour it in a more leisurely fashion. Accordingly, I made a reservation for a king room at a local motel (I briefly considered a B&B, but John and I are not really B&B people – we like to do things on our own schedule) and reserved a table for two for a nice dinner the evening of the 14th. On Saturday we had a leisurely breakfast, ran a couple of errands, threw a few things in an overnight bag and took off. The drive up to Gettysburg takes less than two hours, and once you’re out of Metro DC, the scenery is pleasant. We arrived in Gettysburg around 2 PM and drove around in confusion for a bit until we got our bearings. I wanted to stop by the Visitors’ Center and pick up a map, but there was no place to park in the closest lot and the overflow lots were closed (!). I cursed myself for not printing out the map at the Park Service’s website. John and I decided to just start driving around the battlefield and glean what information we could along the way. If you’ve never been to Gettysburg, a word of warning: the battlefield area is ENORMOUS. 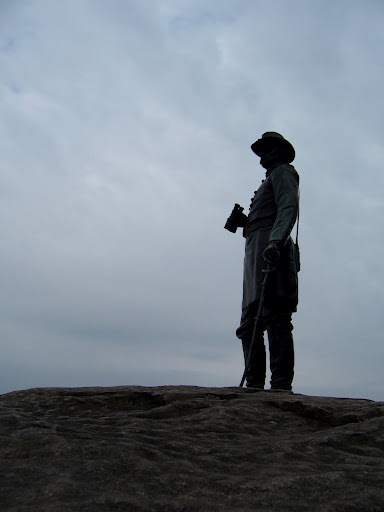 After a few wrong turns, John and I ended up at the southwestern edge of the battlefield. If you want to see where we were, look at the map on this page. We noticed an observation tower in the distance and headed toward that. It was quite a tall tower, but we climbed it and stood gasping at the top, looking out over the view but not quite certain what exactly we were looking at. Handy placards were here and there to read, but we’re not Civil War buffs and it was difficult to get our bearings, both on the topography and its significance in the battle. The view was nice, though. The Eisenhower estate was off to the west, looking serene, and the fields were pretty. We climbed back down the tower and drove south. The road ascended through some woods and we got out of the car to examine monuments. There are monuments everywhere at Gettysburg, in such proliferation that you can barely spit without hitting one. We read them but again, weren’t really grasping what was significant about the site, even with the help of the informative placards. John and I both recalled that on our last visit, we had enjoyed a display called The Electric Map – a huge topographical map that let you see the whole battle unfold before you. We agreed that seeing the map again would be helpful. As we continued along the road, I started seeing signs for Big Round Top and Little Round Top and felt that we were getting into an area we at least knew a little bit about. 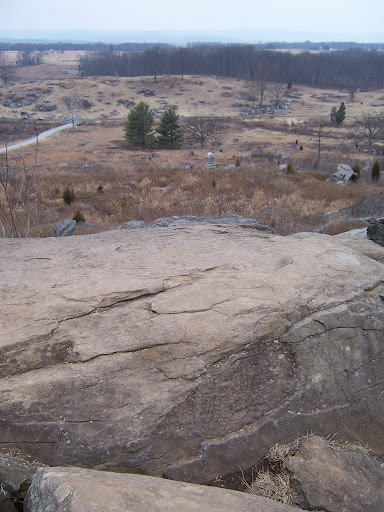 We opted not to climb Big Round Top and instead parked our car on the slope near Little Round Top and walked up. There were a lot of people at Little Round Top and I hated to imagine what it must be like in the summertime, in the height of tourist season. 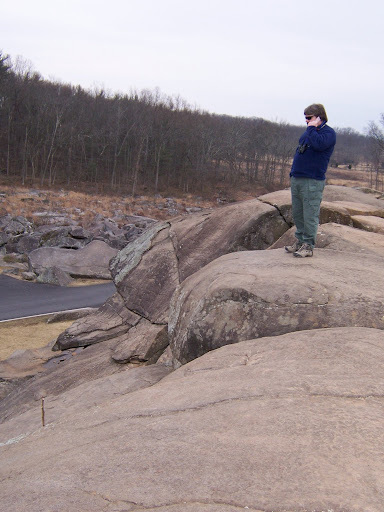 We climbed up the rocks and looked down at Devil’s Den below (in the photo, Devil’s Den is off to your left). The helpful placards explained how strategically important Little Round Top was and how both sides had struggled to possess it. Looking down at Devil’s Den and to the south, the area known as the Slaughter Pen, I began to feel more and more somber. We drove down to Devil’s Den and climbed around the rocks for a while. People here seemed to be in a jovial mood; kids were leaping from rock to rock and shrieking with laughter, grownups were engaged in lively chatter. John got a cell phone call and while he dealt with it, I found a quiet spot and just looked over the area. It made me sad at the thought of so many lives lost in such a desperate struggle. The overcast and gloomy day, growing darker as the sun set, wasn’t helping matters. It was also getting colder by the minute, and I huddled in my coat, waiting for John to finish his phone call. The screaming kids were getting on my nerves, so I wandered further up the rocks, reading the placards and looking out over the nearby fields. By the time John finished his call, the sun was nearly set and we decided to head back over to the Visitors’ Center to try for a map before the place closed down for the night. I wasn’t prepared for his response, nor for his vehemence. The gentleman barked, “Have you visited our museum? It’s got multi-million-dollar, state-of-the-art technology! I don’t understand why people want to look at the old map! It put the kids watching it to sleep! We can’t get parts for it any more! You’re the tenth person to ask about it today! Are you a local?” I said no, I wasn’t local; I remembered the map from a visit a long time ago and I’d found it very useful in understanding the battle. The gentleman finally calmed down enough to tell me that the map was locked up in the old Visitors’ Center, which is slated for demolition “sometime soon.” I thanked him and walked back toward the restrooms, where John was just coming out. I told him about the gentleman and the status of the Electric Map, and he got a familiar glint in his eye and turned toward the Information desk. “Where are you going?” I asked. “I’m gonna go ask the guy where I can find the Electric Map,” he said with a grin. By the time we left the Visitors’ Center, it was beginning to snow. We hadn’t had lunch and our dinner reservation wasn’t until 7:45, so we drove into town looking for a place to get a snack. We opted for Ernie’s Texas Lunch, which I’d picked out as a potential breakfast place Sunday morning. Good thing we stopped in; we discovered they weren’t open on Sundays. We shared a plate of french fries with gravy and John had a cup of soup (both were fine, but really needed some seasoning). Then we checked into our motel (the Quality Inn on Steinwehr; nothing special but clean and well-appointed), and I had a shower while John relaxed in front of the TV. By the time we left for dinner, the snow had just about stopped but to our surprise, the motel parking lot was full and the indoor pool downstairs was full of families. We had a pleasant dinner at the historic Dobbin House Tavern, where I was presented with a red rose, it being Valentine’s Day and all. I had roasted duck and John had prime rib; again, both dishes were under-seasoned but the service was attentive and we were seated near the fireplace, so we were warm and had a little more light to see by (the Dobbin House gives you a single candle on your table – reading the menu is a bit of an adventure). After dinner we returned to the motel, watched some more TV, looked at our maps a bit and then went to bed. 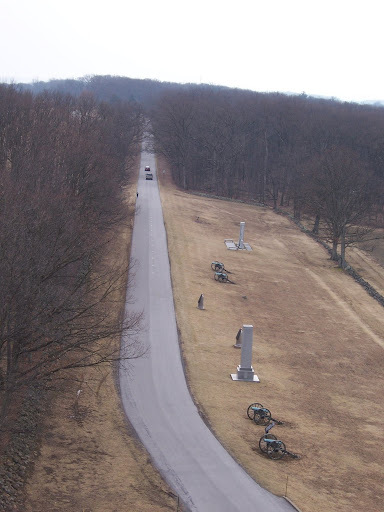 We visited Gettysburg for the first time years ago (I think Chris was in 6th grade) during April break, and took our first look at the battlefield in the early evening. It was so beautiful and peaceful. I’ve been back twice since then, and it is always an impressive experience.